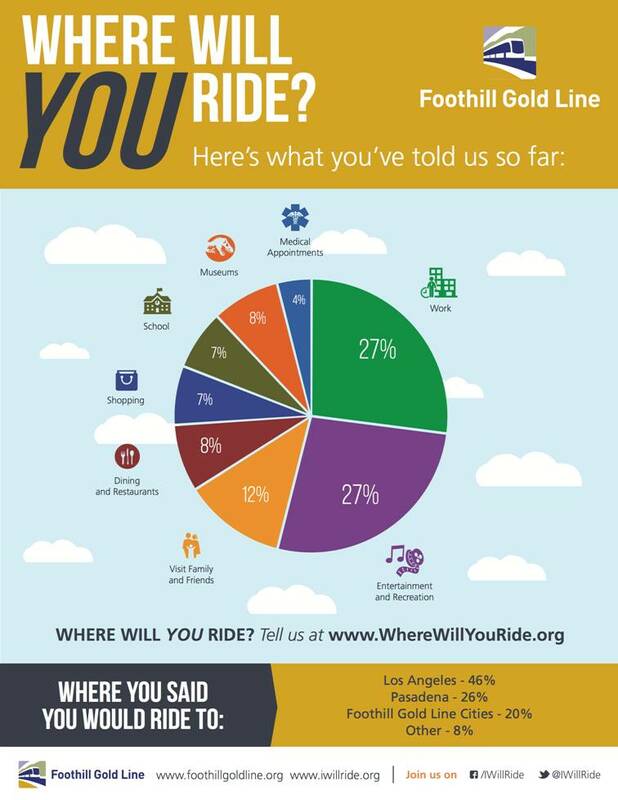 Gold Line Foothill Extension poll results: why will you ride, where will you ride? 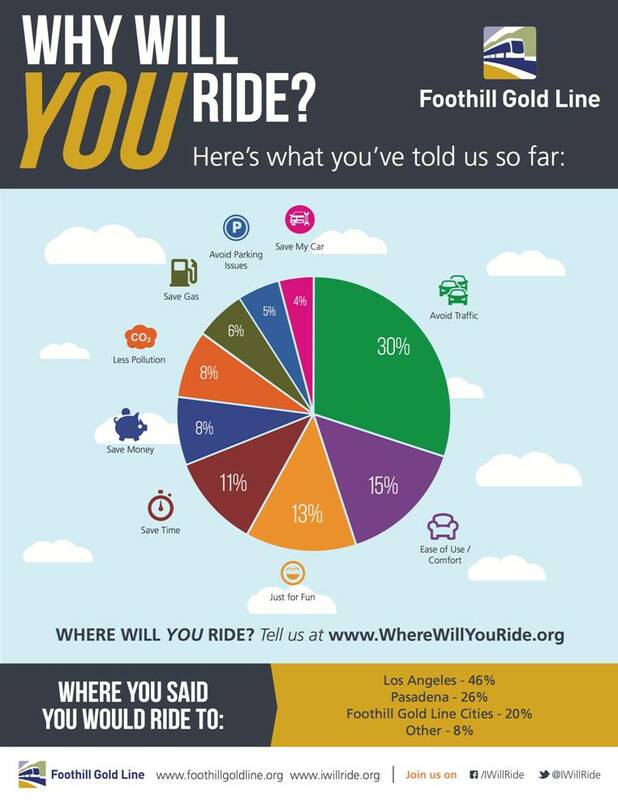 The folks at the Metro Gold Line Foothill Extension Construction Authority have been asking future riders a couple of key questions: why will they ride the new train when it opens next year — and where will they go? The results thus far are above. What caught my eye: I was surprised only 27 percent of those who responded said they would take the light rail line for work. The Foothill Extension, I think, should offer pretty quick service to a couple of key job centers: Pasadena and downtown Los Angeles. The Foothill Extension project is adding 11.5 miles of track from the Sierra Madre Villa Station in Pasadena to the Azusa/Glendora border. There will be six new stations: downtown Arcadia, Monrovia, Duarte/City of Hope, Irwindale, downtown Azusa and Azusa/Citrus College. This is a Measure R-funded project; the Construction Authority is an independent agency building the line and will turn it over to Metro when construction is complete. The project is scheduled to open in the first half of 2016 after testing and employee training. If you would like to participate in the Construction Authority’s survey, click here. Also, check out their ‘I Will Ride’ blog and, as always, feel free to comment here on the project and how you may use it. Hmm. Most likely, unless I find that there’s something of interest to me on the Foothill Extension, I’ll probably “joyride” it once or twice (when I’ve got the time and the fare to spare). Sort of the same way that even though I normally have noplace to go on the Expo Line past Exposition Park, I took a joyride out to the end of the line, shortly after it opened, just to see what was out there, and a second one, one evening, to get a look at the construction site at the end of the line (and see whether the overhead had been strung yet). 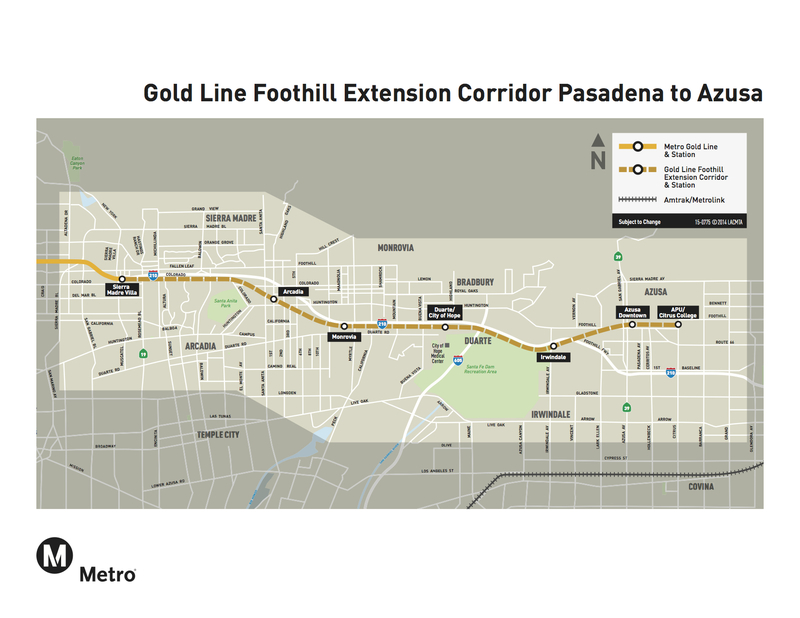 If an all-day express connecting NoHo to Pasadena is created, it would make it easier to visit my cousins in Azusa who will live quite close to the station near APU and Citrus College. I swear, weekend traffic on the 210 is nightmarish. Otherwise, I’d probably just park and ride somewhere in Highland Park or maybe at Del Mar, if just to avoid most of the traffic. Maybe Metro should have conducted the survey before they built the line. However, once the train catches on more people will probably use it; just like what happened with other lines. If you build it, they will come. Metro did not conduct this survey. The independent Foothill Light Rail Construction Authority, who need to hype light rail in order to obtain funding for section 2B and therefore keep their jobs after the handover of 2A, did. Steve Hymon, the Construction Authority no longer uses the term “Metro” in its identification, so neither should you or anyone else at “The Source” (as you did for a while) in order to avoid any chance of confusion between it and the LACMTA. Steve, you shouldn’t be surprised by the 27% using it to go to work. This corridor is easily the LEAST defendable corridor in terms of transportation spending. It is the most ineffective, inefficient use of scarce transportation dollars, as it is connecting the most low-density suburbs of the San Gabriel Valley, some of which still have vast amounts of open space, and are filled with parking lots and unwalkable areas around the stations. Except for a few token gestures towards TOD, few of the cities along the route even want to increase density near/at the stations. Let’s be clear: this line will have the LOWEST ridership of all rail lines in LA County (the portion east of Pasadena) and will just sour voters to any future transit ballot measure. Earth to Metro: BUILD RAIL LINES WHERE THE MOST PEOPLE AND JOBS ARE!!! We should be prioritizing things like the Wilshire subway, which will replace buses that serve over 60 THOUSAND riders a day..versus building rail lines to far-flung suburbs where the buses barely carry a few hundred people a day. It’s pure common sense: build where the data takes you, not based on politicans’ whims and personal preferences! Can’t agree with Transit Rider more. This line may be a real white elephant, even if Foothill Transit re-aligns their services properly. The only station that might see real ridership is Arcadia due to its proximity to its downtown, but the rest of these stations are going to be ghost-towns for a while, especially Irwindale. I hope Metro is prepared for this outcome and ready to deflect the criticism that will follow, as much as I hate to predict it. I could argue against a few of your points, but the Foothill Extension Construction Authority crossed me the wrong way recently, so I will let you have at it. Only about 2/3 of people go to work ever (between retired people, students, children, homemakers, and the unemployed). And even out of people who do work, probably less than half of their trips involve going to work. (Most people only go to work 5 times a week, and make more than 5 other trips, between shopping, eating out, visiting friends, going out for recreation, going to church, running errands, etc.) So it’s no surprise that less than 1/3 of the trips are work trips. Putting aside the issue of what the overall ridership will end up being — predicting the future is hard! — I am still surprised that only 27 percent say they will use the train for work. I do think the strength of this project is that the trains will be pretty quick as there are relatively few grade crossings and there are some stretches of track with no grade crossings (example: Arcadia to Sierra Madre Villa). For the folks commuting to Pasadena or DTLA, I think the train will be a pretty good option at rush hour and might even be faster than driving as the 210 is pretty horrid (particularly west of the 605) and freeway-like Huntington Drive gets congested and has a ton of traffic signals that aren’t very well synched. The Regional Connector, when completed, will also help make the ride into the heart of DTLA more convenient and faster for many passengers. There are obviously some very good TOD opportunities near all the Foothill Extension stations — something that can also be said for some existing Metro Rail stations. Hopefully those will come to fruition across the Metro system, this project included. Steve, predicting the future is not hard when you have millions of dollars worth of transportation demand modeling software, not to mention simple basic data such as: number of residents, number of jobs, number of workers, number of businesses, number of activity centers, sales records (showing economic activity), bus ridership figures, etc. ALL of those basic factors point to one conclusion: the Foothill corridor will be one of the lowest performing rail lines in LA AND the entire nation. Why? It’s simple: there are too few people and jobs, spread out over too big of a space, along the Foothill corridor. Just look at some of the stations – they are literally surrounded by parking lots and vacant land. I can already hear the responses: well why not just build up all those vacant lots and parking facilities? Because those cities are exactly against that sort of density and urban development, part of the reason why they choose to live like they do (large homes, 3 car garage, drive everywhere, can’t even walk to a grocery store for basic goods). These people do not want the sort of density that makes transit SUCCESSFUL. And we should want Metro to pursue SUCCESSFUL transit lines that will attract heavy ridership all day long, not just a few hundred commuters a day that only use the train to get to/from work a few times a week. Metro should focus on true 24 hour, dense communities and corridors that will serve HUNDREDS OF THOUSANDS of riders each and every day, not the Foothill Extension which, by the most liberal estimates, will attract less than even 10,000 riders a day. Some excellent point and well taken! That said, I still say predicting the future is hard, even with modeling software. I’ve been writing about this stuff for some time now and have seen ridership predictions that are very accurate and some that are not so accurate. One thing to keep in mind: the Foothill Extension is being built with Measure R funds. The State Legislature and the Metro Board approved a list of projects to be funded and that list of projects was approved by county voters. Obviously not every voter approved of every project on the list, but enough voters (about 68 percent) apparently found the list overall worthy of their vote even if it was a compromise. And make no mistake: it was not a list purely drawn up by transit planners; it was also designed to get necessary political support. And make no mistake: I agree that transit works best in dense places. But I also think we owe it to the voters to build these projects and I think the Foothill Extension — like other Metro projects — offers a chance to communities along the tracks to become more transit oriented as the years go by. The Extension is also a chance to plug more riders into a growing transit network that will allow some riders to go back and forth between the east and west sides of the county. I live in Arcadia , my relative lives in Azusa, so, we will visit each other use Foothill Extension, between Arcadia station and Azusa last station. If someone lives in Irwindale and that person has a job flipping burgers at a McDonald’s in Duarte, would that person use the Gold Line for $1.75 for one station ride, choose $100 a month for a monthly pass just to go one station away, or just simply drive there? Perhaps they won’t. And perhaps there is someone else living in Irwindale who works in Pasadena, DTLA or elsewhere and for $1.75 will appreciate a relatively quick longer-distance train ride. Yes, because we all know Metro must cater toward those who choose to live a well-paying suburban McMansion-to-white collar office job in DTLA needs cheap per-mile transit over longer distances more than the minimum wage earning burger flipper struggling to pay rent who tend to doesn’t commute far away who ends up paying more per-mile. One way to increase ridership during rush hour traffic is to turn the carpool lanes plus one or two more lanes on the 210 into HOT lanes. By turning the freeway into HOT Lanes drivers will see the value of $1.50 for the rail line. The extension will serve communities that were built around the railroad. L.A.’s version on “railroad suburbs” found in Chicago, New York etc. They have traditional street grids and walkable downtowns. Much better than the sprawl along some of the other lines, including Expo between USC and Santa Monica.